Hear this exquisite work performed by countertenor Charles Humphries and soprano Kathlene Ritch, with a chamber orchestra under the direction of Maxine Thevenot. 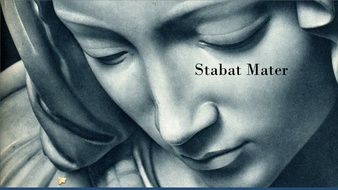 Details: ALBUQUERQUE, NM: Composed in 1736, shortly before his death at the age of just 26, Giovanni Battista Pergolesi’s Stabat Mater remains his best-known work and a masterpiece of the Italian baroque. Come and hear this exquisite work performed by British countertenor Charles Humphries and KHFM’s own Santa Fe-based soprano Kathlene Ritch, with a chamber orchestra under the direction of Maxine Thevenot. Ample free parking is available in the cathedral lots and at the adjacent MFA lot.